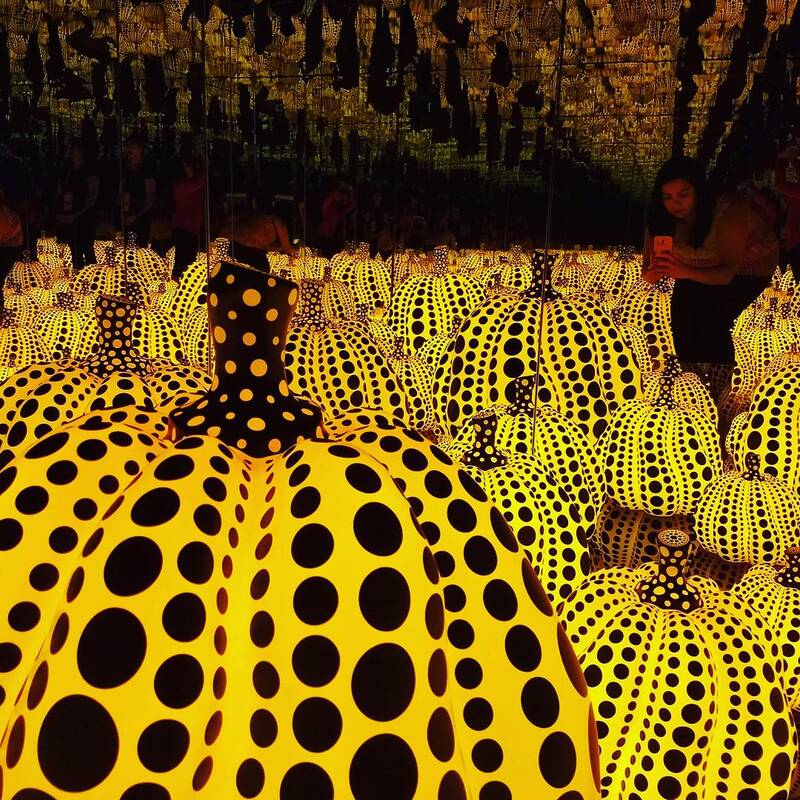 “Mirror, mirror on the wall…” Is the Yayoi Kusama Show the prettiest of all? 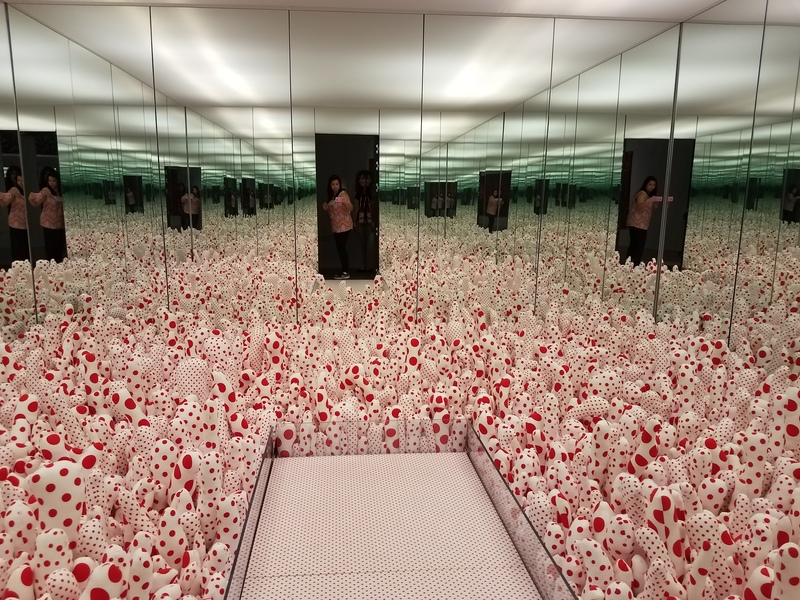 Everyone is talking about the “mirror exhibit.” The exhibit is at the Hirshhorn Museum in DC, which ends on May 14, 2017. After 3 weeks of trying to get tickets online including using 3 different browsers every Monday at Noon to avoid waiting in line for tickets, I realized it was an utter fail. The tickets are sold out within seconds. There is literally no chance of getting it online, so Nguyen was kind enough to wait in line. Surviving the ticket line. The exhibition opens at 10 AM along with the box office. Nguyen got in line at 8:45 am on a Wednesday and there was still about 50 people in front of him. He said there were people had the folding chairs in line. That’s serious business, if people start lining up early on weekdays, think of how early they line up on weekends?!? We went again the next week with a friend, which ended up ticket-less. People have been lining up at 6 AM! They only give about 600 tickets a day. Each person can ask for 4 tickets, so if you do the math, if you are not in the first 200-250, you will not have a chance. Coffee is a must. If you decide to wait in line, it’s long…4 hours long. One person=Four Tickets. Yes, each person can request up to four tickets. You don’t have to be in line to get the tickets necessarily if you have a nice friend willing to wake up really early. You are confused. 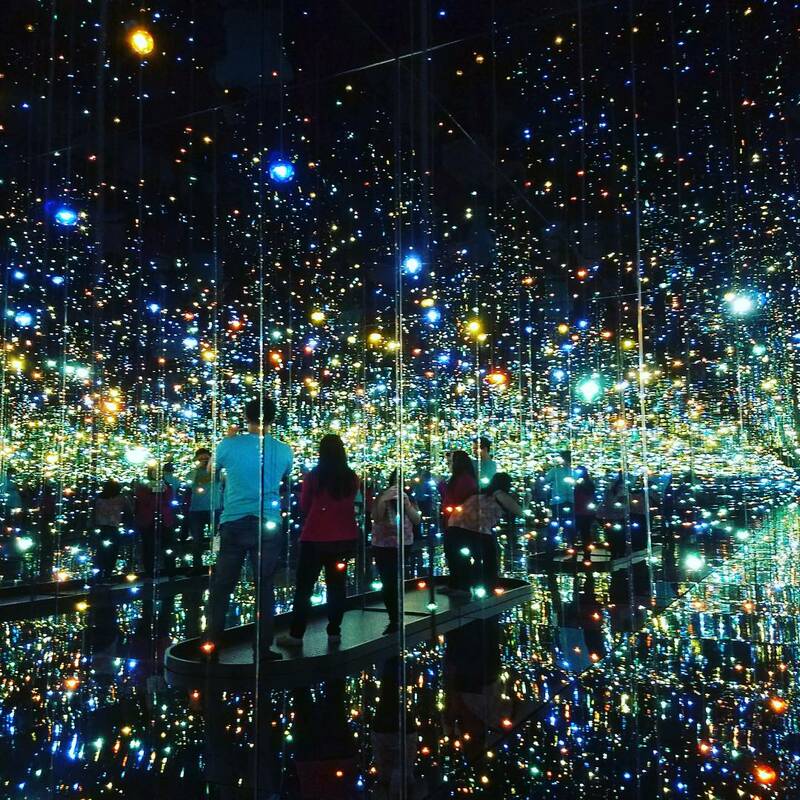 The first time you go into the exhibit, you don’t know what to do. You can count your first exhibit as a tester. Don’t just get in the first line you see. The best decision we made is to work our way backwards. Hardly anyone was in the last lines and by the time we finished, there wasn’t anyone in the first exhibit either. The only ones with a long line were the ones with the hanging lights. 20 seconds goes by quickly. They are very strict about the time in each exhibit. The minute you walk in, the staff member clicks a timer. Go in groups of 2 or 3 people. They will ask you if you are a group of 2 or 3. We decided that Nguyen should go alone because maybe he will be paired up with his dream woman. 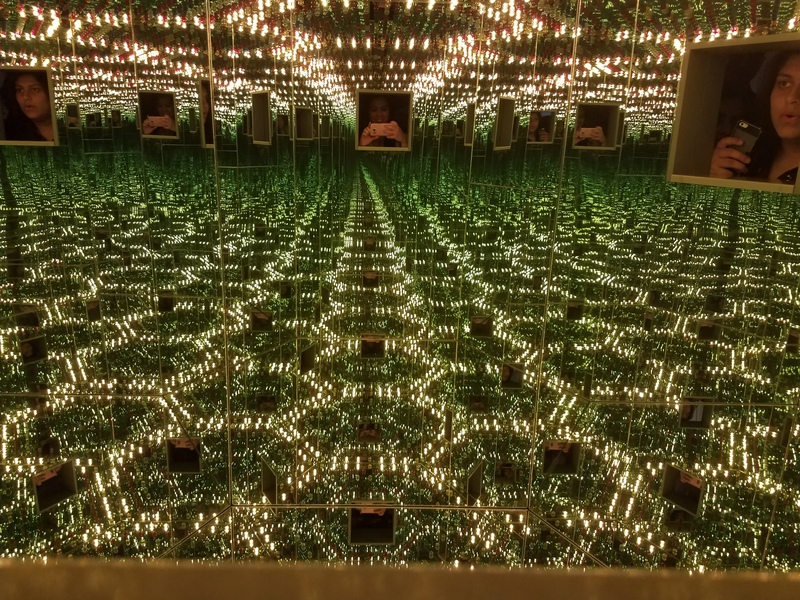 Think about how romantic it would be to say you met the love of your life in the infinity mirror room and within 20 seconds you fell in love? So, on one exhibit it worked, Nguyen got paired up with a cute girl, but then I turned around and another guy walked in. When Nguyen came out, we found out the girl lied. They were together. The exhibits are tiny. The exhibits are a small room, the walkway fits one person comfortably, you might be able to squeeze two people in. Have your camera ready before you enter. The minute you step into the room, the timer starts. Don’t forget all the artwork around the exhibits. There are other art pieces all around the exhibits and there is also the main exhibit upstairs as well. Go again if you didn’t get the right angle. After waiting in line for so long, if you don’t get the pictures you want, go back until you get it because you may never get another chance to visit. Pick the earliest time slot. As the day goes on the exhibit gets busier. It’s empty first thing in the morning or during the middle of the day. Don’t go into the sticker room until the end. You might get distracted with all the stickers and want to start there, but once you enter, you cannot go back in, so make sure it is your last stop. Is it worth waiting in line for that long? I will be honest, no…It is not worth the wait. 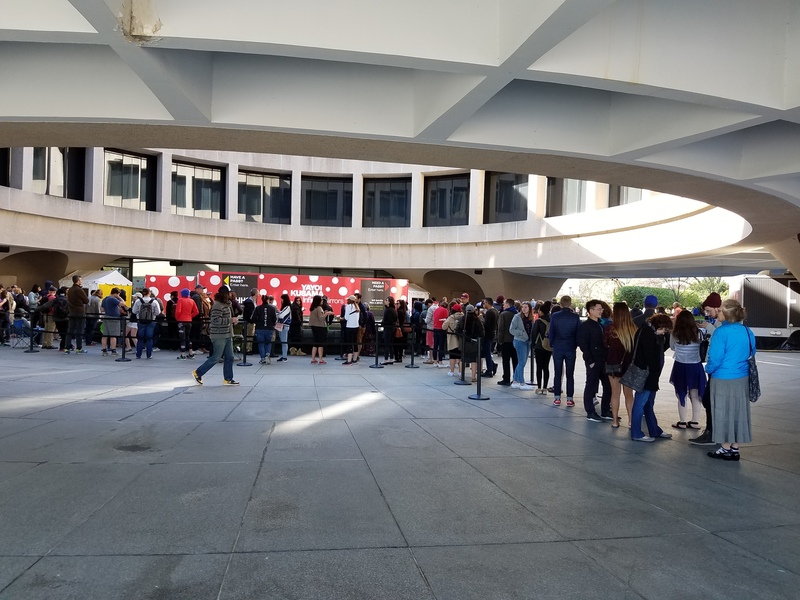 The line is about 3-4 hours long just to get tickets and then the entire exhibit is another 2-3 hours. 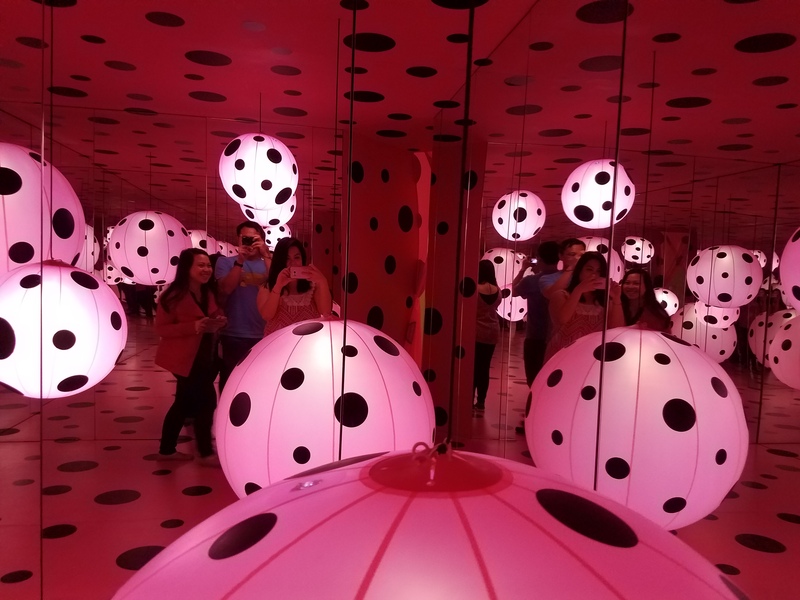 If you have the time, I would say go to it for the experience, but if you miss the exhibit, it’s ok.
And really, they are a bunch mirrors…with different reflections. Other ways to get in? $50 Day Membership. There is a separate line to purchase a membership, but it is only good to enter the day of for you and a guest. You should come about 9 AM to wait in the “membership” line. But the catch is…it is only valid for students, senior citizens, and military. The $50 is also tax-deductible. $250 Exhibit Membership. 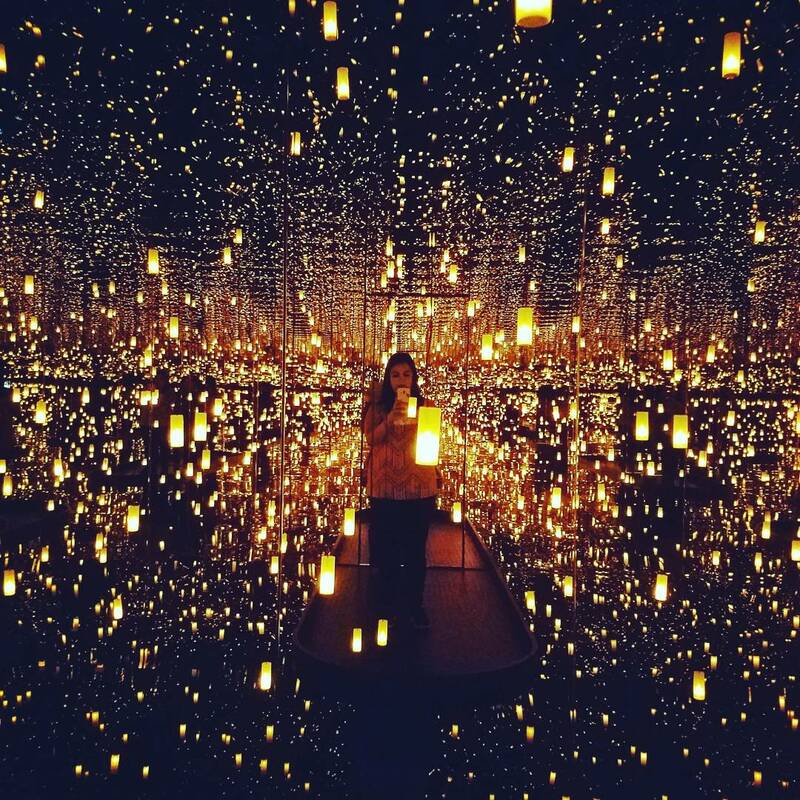 This allows you and 3 other guests a one-time visit anytime during the exhibit. You also get an annual membership for 2 and $115 of the fee is tax-deductible. Parking is a B*t@h. Don’t let your wonderful experience end with your car being towed. The streets around the area have a 2-hour limit and during certain hours’ cars are not allowed at all. You can go a few blocks over and park in a garage or along the streets. The closest parking I found was by Capital Grille.